The Doncaster Mile is one of the premier Group 1 races held on Day 1 of The Championships on the first Saturday in April during the Sydney Autumn Racing Carnival. Held at Royal Randwick Racecourse it is one of four elite level features on Doncaster Mile Day and is supported by the Group 1 TJ Smith Stakes (1200m), Group 1 Australian Derby (2400m) and Group 1 ATC Sires’ Produce Stakes (1400m). Offering a lucrative $3 million in total prize money including $1.8 million to the winner the event is contested over 1600m under handicap conditions and is open to horses aged three-years-old and over. Each year the winners of the Flight Stakes, Villiers Stakes, Chipping Norton Stakes, Randwick Guineas, Canterbury Stakes, Coolmore Classic and George Ryder Stakes are exempt from Doncaster Mile ballot. Of those the traditional lead-up is the George Ryder Stakes (1500m) held at Rosehill a fortnight before. The George Ryder Stakes – Doncaster Mile is a popular betting double and the latest horses to enjoy wins in both races during the same season are Vision And Power (2009) and Winx (2016). Non-Group 1 races offering a Doncaster Mile ballot and penalty exemption are the Ajax Stakes and Doncaster Prelude. Horses coming out of the Doncaster Mile can back-up on the seven day turnaround into the autumn’s richest race – the Group 1 $4 million Queen Elizabeth Stakes the following Saturday. The latest edition of the Doncaster Mile takes place on Saturday April 6, 2019 . The full 2019 Doncaster Mile results and finishing order will be published below once the classic is run and won on Saturday April 6, 2019 . The official Doncaster Mile 2018 Results saw Happy Clapper salute by two lengths on way to a clash with Winx in the Queen Elizabeth Stakes. Doncaster Mile betting markets are led by horses with proven Sydney form over the distance that ran well last time out in Group 1 company. From 2004 – 2018 just two Doncaster Mile winners didn’t run in Group 1 company last start when Triple Honour (2008) improved on a Group 2 Hobartville Stakes sixth to win and It’s Somewhat (2017) came off a Group 2 Ajax Stakes victory. Because of the handicap conditions of the race three-year-olds have a strong record and often feature strongly in the Doncaster Mile odds. From 2006 – 2018 five three-year-olds won the Doncaster Mile including Kermadec (2015). Chris Waller-trained horses are always popular in Doncaster Mile betting as the Sydney horseman prepared six of the ten winners from 2008 – 2018 including four straight thanks to a double by Sacred Falls (2013-14) followed by Kermadec (2015) and Winx (2016). Our early, all-in Doncaster Mile betting odds and futures prices on the hopeful milers heading towards the April classic are listed below. The Doncaster Mile field has a field limit of 20 starters and was run at capacity in 2016, 2015 and 2014 when It’s Somewhat, Kermadec and Sacred Falls saluted respectively. Winx (2016) was the last horse to complete the George Ryder Stakes – Doncaster Mile double. Photo Credit: Steve Hart. Gallopers come into the Doncaster Mile via a number of different autumn lead-ups but the most popular is the George Ryder Stakes run over just 100m shorter two weeks earlier at Rosehill. 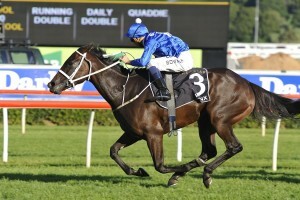 The George Ryder Stakes produced eight of the Doncaster Mile winners from 2004 – 2018 including the star mare Winx (2016) who won the double. The other race producing many runners in the Doncaster Mile field is the Group 1 Ranvet Stakes (2000m) on Golden Slipper Day, horses dropping back in distance for the lucrative Randwick feature. Doncaster Mile nominations close in early February followed by first acceptances at the start of March. The final field of Doncaster Mile acceptances and barrier draw are released on the Tuesday before the race. The official Doncaster Mile Handicap 2018 Nominations attracted 181 autumn hopefuls including Happy Clapper who has finished runner-up to Winx (2016) and It’s Somewhat (2017) for the past two years. There is also a very strong international contingent among this year’s Doncaster Mile entries including a host of Japanese raiders. Doncaster Mile tips favour proven milers with good autumn form throughout the carnival. All 19 Doncaster Mile winners from 2000 – 2018 had their final lead-up at Rosehill Gardens so watching for gallopers that ran well in races including the George Ryder Stakes is always a good tip. From 2004 – 2018 five favourites saluted for the punters with the latest being Winx (4/5 in 2016). Three-year-olds have a good record and are feature in Doncaster Mile tips along with Chris Waller-trained runners and well-weighted chances with just three horses carrying more than 55.5kg to victory in the race since 2003. Our Ladbrokes’ insider Doncaster Mile 2019 betting tips on the Group 1 1600m classic will be detailed below with the milers to back and sack this autumn so stay tuned. The Doncaster Mile form guide shows punters the barriers, jockeys, trainers, weights and lead-up runs of the horses in the field. Looking for Rosehill graduates that come out of autumn Group 1 races is important when doing the Doncaster Mile form. The Doncaster Mile barrier draw hasn’t been of huge significance in the race with an even spread of winners from across all of the gates, but the most successful since 1983 producing five winners is barrier 12. The most successful Doncaster Mile jockey with six wins since 1996 including Kermadec (2015) is Glen Boss who also rode three winners on the trot from 2006 – 2008. A link to our comprehensive Doncaster Mile Handicap 2019 Form Guide will be provided by punters the week of the race. The Doncaster Mile results and finishing order are known on Day 1 of The Championships on the first Saturday in April each autumn. Single-figure hopes have dominated the Doncaster Mile results in the past two decades. The longest priced winners in recent years though have been It’s Somewhat ($34 in 2017), Sacred Falls ($21 in 2013) for her first of two victories and Patezza ($21 in 2005). Other notable Doncaster Mile winners in that time include Winx (2016), More Joyous (2012), Rangirangdoo (2010) and Racing To Win (2006).